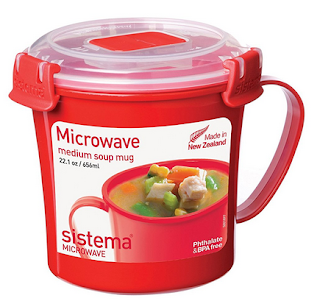 HURRY over to Amazon where you can score this Sistema Microwave Collection Soup Mug in medium for just $4.99! Made in New Zealand, this dishwasher-safe soup mug is designed to conveniently cook soup, stew, noodles, hot drinks, and more at home or the office. Simply heat the contents in the microwave and then eat or drink straight from the mug. It features a lid with a steam release vent for splatter-free heating and cool-to-the-touch, easy-lift tabs.